Three days ago, John Marsh sprung on us the idea of testing a chimpanzee on FTDNA’s standard 67 Y-DNA STR markers. To quote John: “Chimpanzee and Bonobo are sufficiently different to each other, and to humans, to make differences between their Y-DNA markers potentially interesting, and give insights into how mutations of Y STRs have wandered along over very long time periods. The common ancestor of humans and Chimps is about 100 times longer than the common ancestor of all human male lines”Â Today, I am announcing the formation of the Chimpanzee Y-DNA Project. In FTDNA’s database it will be a Y-Haplogroup project and the official name is Close_Cousins. The original goal is for fun and curiosity since we don’t really know what we’ll get. But hopefully we make some interesting discoveries that may prove useful and encourage further research. 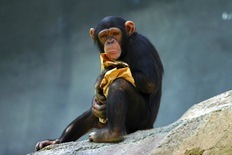 One of the goals of the Project is to obtain a DNA sample from a chimpanzee and a bonobo (preferably a cheek swab) and have it analyzed at 67 STR markers by Family Tree DNA.Â Although the project has graciously received funds from a number of donors (see here for a list of these scientifically curious and kind donors) that will enable the purchase of a regular 67-marker test from FTDNA, there will almost certainly be extra analysis required due to 6 million years of sequence divergence.Â However, Bennett Greenspan of FTDNA has kindly offered to cover the costs associated with extra processing. Why compare the human Y-STR markers with the chimpanzee markers?Â Aside from merely satisfying intellectual curiosity, this project could reveal interesting information about the mutation rates of some markers, among other information. Last December, I became a co-administrator of the Close Cousins Project with Bill Davenport.Â As such, I am requesting your help in advancing this project.Â Our biggest current hurdle is identifying a source of chimpanzee and bonobo Y-DNA.Â Do you have any insightful ideas to share about how to obtain the necessary DNA?Â Do you have an acquaintance who might have [legal] access to chimpanzees and/or bonobos?Â Know someone who owns a chimpanzee and/or bonobo? We would appreciate any helpful suggestions or connections in our pursuit of this project. Lastly, as a law student I am cognizant of the fact that collection of DNA from a non-human primate â€“ even using a painless mouth swab – might trigger some state and/or federal regulations.Â I am working to ensure that the project satisfies these regulations when collecting DNA from primates. The person you should contact about bonobos is Frans de Waal, a professor of psychology at Emory University and at the Yerkes Regional Primate Research Center in Atlanta. Before you do so, you should have a look at his book, Bonobo, The Forgotten Ape, University of California Press, 1997. ISBN 0-520-20535-9. Have a look at the photos on the cover and on page vii and you will see why some people think that Pan paniscus should be renamed Homo paniscus.